This is a large 12”x8” (305mm x 204mm) Flat Pine, box frame with a 3 aperture mount with a smaller extra space for a name (this can easily be added to your finished keepsake by writing or printing the details on a piece of card or paper and attaching it at the back of the mount in just the same way as attaching your photo). The spaces either side are approx. 6"x3.5" (152mm x 89mm) and the smaller, photo space in the middle is 5"x3.5" (127mm x 89mm), the name space is 0.5"x3.5" (13mm x 89mm) making this an excellently proportioned frame to display your casts in, along with a name or date detail. 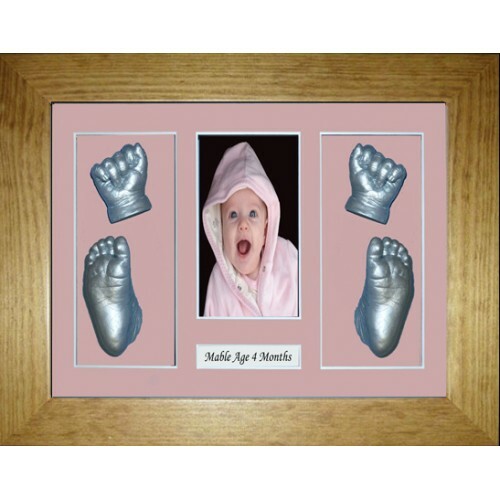 This option is ideal for displaying a photo in the middle and either a single hand and foot cast either side of it, or 2 casts on either side, this is dependant on the size of your casts. There are enough materials for up to 12 new baby casts (up to 1year approx.) less if the child is older, but still plenty of material to practice with and get creative and everything you need is in the kit to make your own special keepsake. 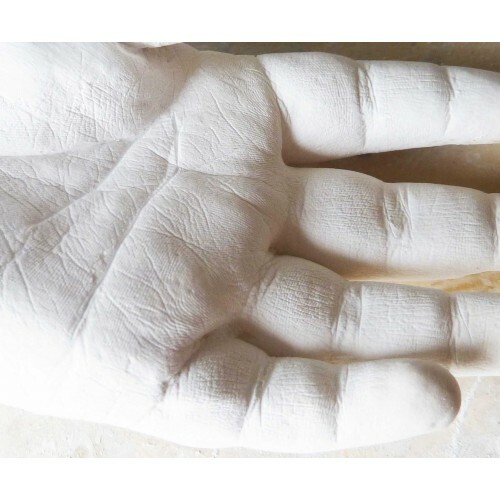 You can even use this kit to have a single cast from 2 children and display one cast on each side of your photo; there is enough alginate to do this, just ensure that the older child's hand or foot will be able to fit in the 6"x3.5" (152mm x 89mm) space, generally a natural held hand of a toddler will take up less room than a foot, so if the older child's foot won't fit, try a hand instead. All in a gift box. This price is inclusive of VAT and we also offer FREE UK MAINLAND postage, for all other areas we offer a small subsidized posting charge.